Especially after eating peanut butter and honey toast, the mirror comes in handy for checking if she's cleaned off all of the goo. 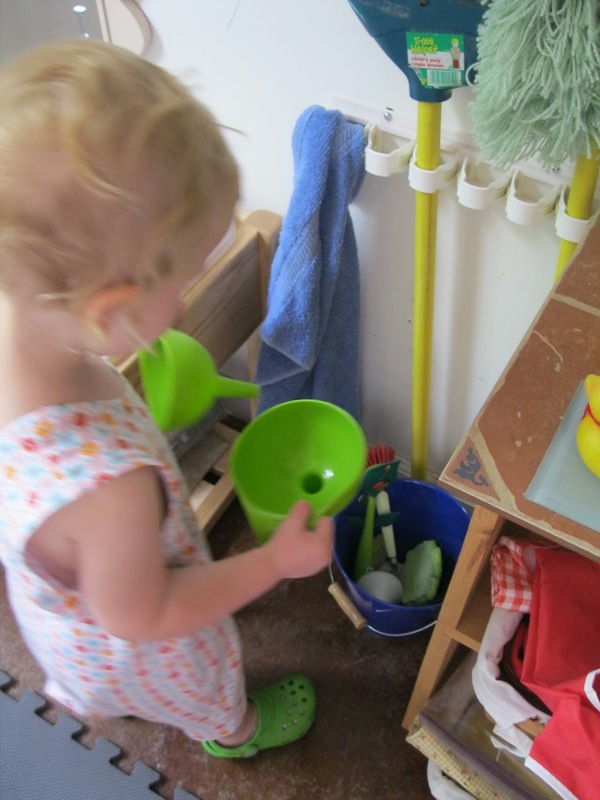 You can never have too many funnels or buckets, right? The deep dish pans don't have drains and there's no running water, so I just give her as much as she needs in the large white pitcher. When she learns to wash clothes and dishes we'll probably fill both pans with water. This narrow strip of the laundry room is no bigger than 2 x 8 feet. The dish strainer mounted to the wall is from Ikea, as are the funnels. 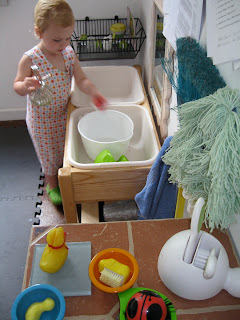 She has a doggie nail brush and a ducky one (hand-me-downs from her older sibs). 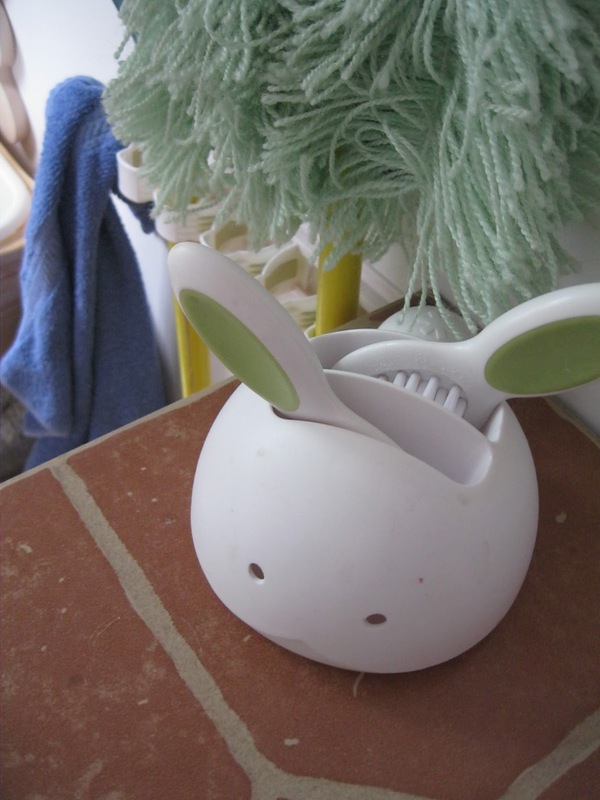 The ladybug pot scrubber is new and came from TJMaxx. They sit atop a cheapy clearance wooden shelf from Michael's that was just the right height for a toddler. Right now there is a sample tile purchased from a home improvement store (back when I thought we'd put "real floors" in the laundry room) on top of the shelf. The little plastic bowls help her to remember to put the soap and nail brush away. They came from Target's kitchen department. 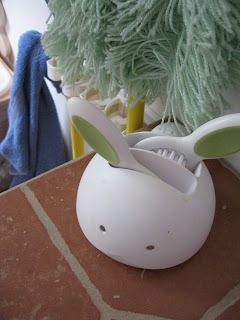 This bunny comb and brush set was too cute to pass up! Catching up on my blogs after a busy couple of weeks...I love this concept! I wish I had known all these things when my kids were little. 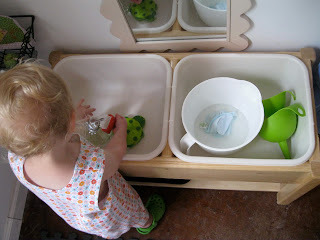 What a great way to teach responsibility and hygiene.